Denver grew by over 80,000 people in the past five years — thanks to a strong job market that brought in new chefs, festivals, bars, and a spot on top of plenty of Best Places to Live lists. But why move to Denver — with its now-booming housing prices — when you can have it all in a long weekend? Here’s your guide to exploring the natural wonders, the best beers on the planet, the legitimately exciting food scene and, if you so desire, sampling the dispensaries. 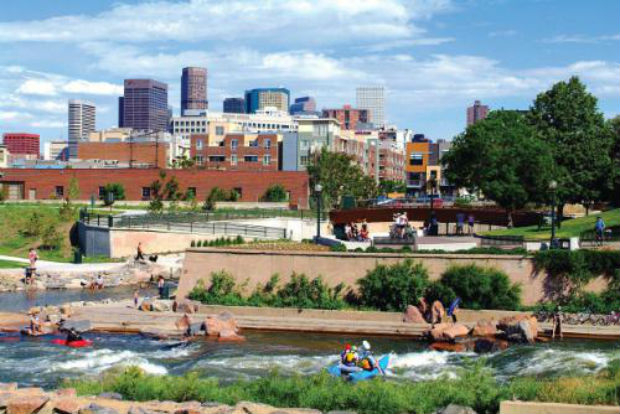 The South Platte River skirts downtown and offers Class II and III rapids. Access the water 15 miles south of town at Chatfield Lake and paddle back to Confluence Park — where you’ll find the conveniently located Confluence Kayaks ($50 for a daily kayak package). Urban running and bike trails abound, and provide a great way to see the city (or tour the 62 breweries). For less-urban adventures, Denver Zipline Tours is a 30-minute drive away and offers Colorado’s longest and fastest lines, criss-crossing a mountain valley. Or you can head to Boulder’s Chautauqua Park (40-minute drive) to ascend one of the iconic Flation climbing routes. We recommend Colorado Mountain School if you want a guide (ask for Joey Thompson). Denver offers a melting pot of American cuisine with few blind spots. In the morning you can grab a quick and satisfying breakfast at Snooze AM Eatery (two locations downtown). And on the weekend, cross the river for brunch and a comfortable seat at Root Down in the Highland neighborhood. If you want to stay downtown, head to the historic Larimer Square to browse menus: Russell’s Smokehouse has the best ribs you’ll find in the Rockies, Euclid Hall offers innovative pub fare with a killer beer and cocktail list, and the Mediterranean-inspired Rioja features more exclusive options like New Zealand red deer and Colorado lamb loin. The cocktail and local spirits scenes are some of the best in America, but for beer, Denver is one of the best spots in the world. The greater metro area is dotted with 100-plus breweries, but you’ll find an especially dense swath of roughly 15 brewers running for two miles near Walnut Street. On the southwest end is Denver’s original brewpub, Wynkoop, and Blackshirt Brewing is at the top. In between are gems like sour specialist Crooked Stave, Utah-native Epic Brewing, and the venerable Great Divide. For a more moderate crawl, head to the Highlands neighborhood duo of Denver Beer (get the Graham Cracker Porter) and the German brewing experts at Prost. If you’d rather rest your feet, beeline to Denver’s longtime craft beer mecca, Falling Rock Tap House, for a selection of 200-plus of the best local, American, and European brews. Downtown has been thriving for the last decade, with the crown jewel being the remodeled Union Station — which features craft beer, farm-to-table dining, eclectic hotel rooms, and light rail from Denver International (beginning April 22). Book a Pullman room, with art deco stylings inspired by the luxury sleeper train cars, at the Crawford Hotel in Union Station (starting at $289). The dog-friendly hotel is walking distance for everything worth visiting downtown. But if you want to venture farther out, the Crawford offers complimentary transportation within a two-mile radius. The hotel occupies part of the recently renovated train station (built in 1881), which is also filled out with the top-notch Terminal Bar, farm-to-table dining at the Mercantile, and third-wave cafe Pigtrain Coffee. If you seek beer nirvana, head to Denver the first weekend in October for the Great American Beer Fest — arguably the world’s greatest collection of craft brewers under one roof. And while you know of Red Rocks Amphitheater as one of the finest outdoor music venues, it doubles as Denver’s Muscle Beach (sans-meatheads) with informal and coached sweat sessions up and down the 69 rows of seats.